The Midori Bundt cake was a hit. The inside was a spring-like green which made for interesting conversation. The melon did transfer rather nicely to cake, and perhaps because it was tamed by the pistachio flavoring, was neither overwhelming nor weird. All in all, this was an excellent last minute party cake due to its unique appearance, pleasing taste and the conversation generated regarding Midori. All that being said, it tastes like something from The Cake Doctor. There’s no denying the flavor of a cake mix based cake. Try as you might to disguise it, you just can’t. Luckily, a lot of people like cake mix based cakes, so that’s not a real issue. What I’ve noticed is that most people care more whether or not a cake is moist (which this one is) rather than if it has a cake mix taste. So all in all, compared to other cakes in the goofy-cake mix-based-bundt-cakes -class it was grade A. Definitely save the recipe for your next big Easter or St. Patrick’s Day party. 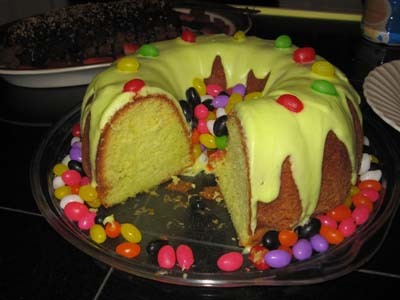 Here’s a link to the recipe for Midori Bundt Cake. I’m glad to see the review was good for this cake! While I don’t prefer cake mix cake, I sure know plenty of opportunities come up where this cake would be appreciated. tg, you might want to ask your doctor for some Ambien. It will really help you, when you are lying in bed at night trying to think of how melon and cake taste together.Longhorngal, you should have swiped the Midori. Yummm! I thought I tasted pistachio! It was a great springtime cake. My dad thought it would also be a good color for St. Patty’s day. He also got out the family bottle of midori for possible tasting… amazing what the parents have hidden in a pantry… I had no idea.Dad was excited that he’ll be able to have the remaining slice for breakfast. How nutritious!